The Texas Legislature closed out the special session Tuesday night amid a stalemate on property tax reform, leaving unfinished Gov. Greg Abbott's top priority. 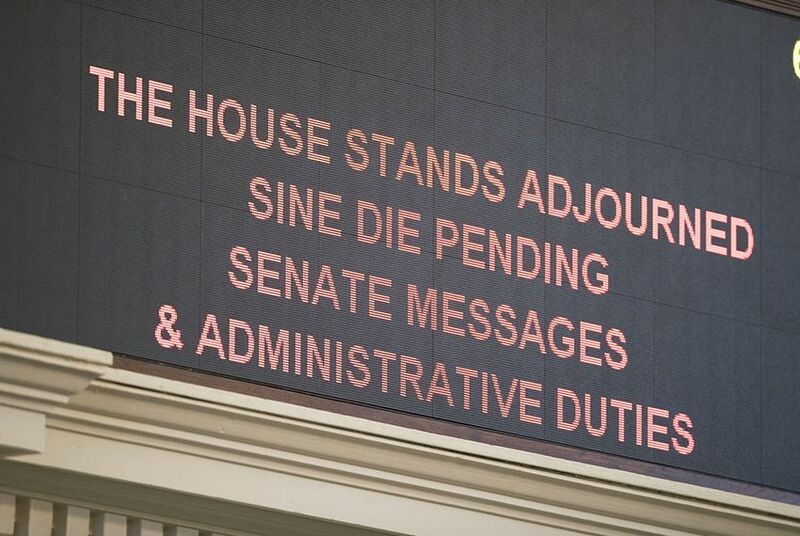 Hours earlier, the House abruptly adjourned sine die – the formal designation meaning the end of a session – after advancing a school finance compromise to Abbott's desk but declining to further negotiate on a key property tax proposal. When the Senate returned later in the night, it rejected the only remaining option to get the bill across the finish line, which was to accept the House's version. "We are not going to accept the take-it-or-leave it proposal from the House, and we are going to fight another day," said state Sen. Paul Bettencourt, the Houston Republican who had authored the property tax bill. "I hope the governor calls us back as soon as possible." It was a disappointing end for Abbott's No. 1 issue, but the governor appeared pleased with the results of the special session. There was no immediate indication of whether he was open to calling another special session to keep trying on property tax reform. "Our office believes this special session has produced a far better Texas than before," Abbott spokesman John Wittman said in a statement. Abbott called lawmakers back for for the special session on July 18. Special sessions can last for up to 30 days, which gave both chambers until Wednesday to work. Abbott ended up getting half his ambitious 20-item agenda to the finish line. The list of achievements included the must-pass "sunset" bills that will keep some state agencies from closing as well as proposals to crack down on mail-in ballot fraud, extend the life of maternal mortality task force, reform the municipal annexation process, limit local ordinance regulating trees and impose new restrictions on abortion. At a news conference after the Senate adjourned, Lt. Gov. Dan Patrick also said he was proud of the Legislature's accomplishments during the special session. But Patrick's tone quickly darkened when he turned to what was left undone. He placed the blame for almost all of Abbott's failed special session priorities on Speaker of the House Joe Straus. "Thank goodness Travis didn't have the speaker at the Alamo," Patrick said. "He would've been the first one over the wall." Patrick said the San Antonio Republican had treated the governor's agenda "like horse manure," blocking votes on measures like the "bathroom bill," private school vouchers and defunding Planned Parenthood. "We missed some major opportunities, but what I'm most upset about is the House quit tonight," he said. "With 27 hours to go, they walked off the job." Straus came out with a statement of his own on Tuesday night, saying, "I'm proud of our House Members who worked diligently in the special session, passing legislation that was in the best interest of all Texans. The House was thoughtful, respectful and decisive in its solution-oriented approach." The House's abrupt adjournment came after days of difficult negotiations with the Senate on school finance and property tax bills. House Ways and Means Chairman Dennis Bonnen had been expected to appoint members to a conference committee Tuesday so the two chambers could reconcile their versions of the bill. "I have been working with members of the Senate for several days on SB 1, we have made our efforts, so I don’t want there to be in any way a suggestion that we have not, will not, would not work with the Senate on such an important issue," he said. Then he said he had not appointed a conference committee because he was "trying to keep the bill alive." "If we appointed conferees now, it would kill the bill because there is not enough time," he said, explaining that under House rules, there would not be enough time left in the session to issue a conference committee report and have the chamber vote on it. Bonnen's announcement came after a vote on a school finance measure in which House members expressed deep disappointment —and anger — that the bill they had sent to the Senate had come back largely stripped provisions the chamber had fought to keep, including reducing $1.8 billion in funding for schools to only $352 million. "I'd tell the Senate to take back this crap and fix it," said state Rep. Senfronia Thompson, D-Houston, adding that she did not like "being bullied." The House ultimately approved the changes to the bill, sending it to the governor's desk. While House lawmakers didn't get their way with school finance, by adjourning Tuesday night, they forced the Senate to either accept their version of the property tax bill or let it die. A key point of contention between the chambers: whether the the threshold requiring voter approval of property tax increases should be at the 6 percent preferred by the House or the 4 percent preferred by the Senate. Some conservatives, including Patrick, have claimed an automatic election trigger would drive down property taxes. But such elections would only happen when taxes rise. Bonnen and other House members repeatedly said the automatic elections would not drive down taxes. They also said transparency provisions that existed in at least two bills sitting in the upper chamber Tuesday would have made it more clear to homeowners which local government entities were behind rising tax bills. And while the Senate focused on what increase should require voter approval, the House debated and passed far more bills during the special. That included legislation that would have lowered property tax payments for some Texans, including the elderly, disabled and military members. So far at least two other Senate Republicans, Don Huffines of Dallas and Brandon Creighton of Conroe, have joined Bettencourt in calling for a second special session on property taxes. Patrick, at the post-adjournment news conference, said he would leave it up to the governor to decide. Both Lt. Gov. Dan Patrick and Abbott have said property tax reform is their top priority for the session. Patrick forced the special session by holding hostage a bill needed to prevent the shuttering of some state agencies during the regular session in May. At the time, he said he was doing so in order to push the House to move on two pieces of legislation: one that would regulate bathroom use for transgender Texans and another that would set new thresholds for when cities and counties must get voter approval for their property tax rates. Just as during the regular session, the House never took a vote on a "bathroom bill" during the special session. Brandon Formby, Emma Platoff and Shannon Najmabadi contributed reporting to this story.